Consumers have higher expectations than they used to. A decade or two ago, people were happy as long as their order got to their house within a day or two of the scheduled arrival date. But now, consumers expect next-day and same-day delivery options, and they want to track their orders through every stage of the delivery process. Is your business efficient enough to receive an order, prepare it, and deliver it on the same day? If not, your customers will surely find one of your competitors that can. Here’s another question: do you still plan your routes with pen and paper? If so, you need to stop immediately. Manual route planning takes hours, so it gets in the way of everything else you need to do to run a business. Also, there’s no guarantee that the routes you come up with are efficient or even accurate. Instead of planning routes manually, you should adopt route optimization software. Such software allows you to provide your drivers with more efficient routes, which helps them show up on time more often. Your customers will love that! You’ll save money on gas, too. 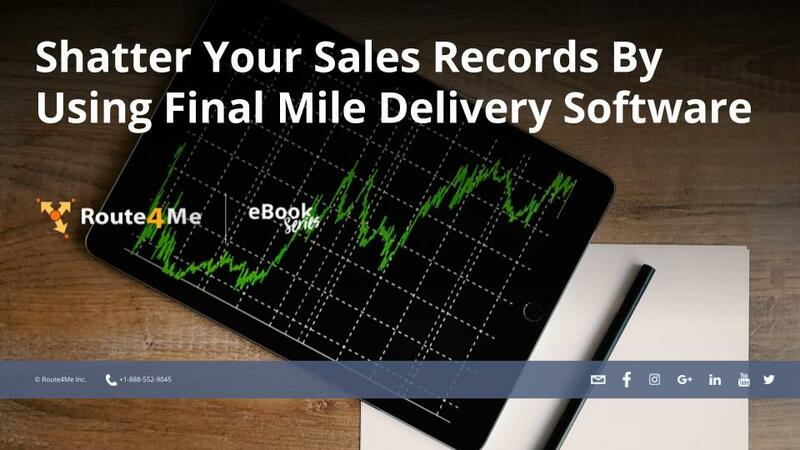 With final mile delivery software, planning routes only takes 30 seconds. All you need to do is plug in your customers’ addresses, and then the software does the hard work for you. Optimized routes won’t do you any good if your drivers don’t actually follow the routes you give them. That’s why the route planner you invest in absolutely must have a GPS tracking feature. With GPS tracking, you can see where your drivers are in real-time.